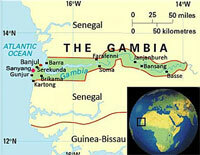 With a size of 180 miles / 21 miles, The Gambia is one of the smallest countries in Africa. The Gambia is named after the river that meanders through mangrove swamps, bamboo forests, and salt flats, to the capital Banjul, which is located along the 30 mile stretch of Atlantic coast. From June to November, the weather is warm with a very rainy season. From December to May, the climate is dry and warm, attracting many tourists due to ideal climatic conditions. Gambians are known for their excellent music and dancing. They are well recognized for their genuine friendliness and hospitality. A wide variety of tribes exist together, living harmoniously as each preserves its own language and traditions. The official language is English. Other main languages spoken are Wolof, Fulani, and Mandinka. The Gambia Public Transport Corporation offers an extensive, low-coast public transit system with bus service linking all the towns in the country. Taxis are readily available, and car rental agencies offer unlimited mileage. The country's biggest asset is its tourism, with tens of thousands of international visitors annually, enchanted by its beautiful beaches, flora and fauna, sunshine and pleasant climate, and the Gambian people whose hospitality and friendliness are well renowned. The Gambia has much more to offer: rich history, culture, and ethnic diversity, ecotourism, water sports and deep sea fishing, and the multiple world-class hotels. 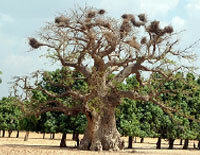 The Gambia is one of the safest countries in West Africa.